Debbie Gillespie Cake Design (formerly Farnley Fayre) was established in 2014 in Huddersfield, West Yorkshire. Comprising of just its founder, Debbie Gillespie, the company aims to provide unique and innovative wedding cake designs for creative couples. Inspiration for her designs are taken from her beautiful Yorkshire surroundings so woodland influences with natural textures and bold sugar florals feature heavily. There is also a strong use of art and sculpture, using watercolour-style handpainting, modelling and different stacking techniques to build alternative design ideas. From travel-inspired pieces to personalised hearts, there is something for every happy couple in the new cake topper collection from luxury wedding stationers norma&dorothy. Taking inspiration from the natural world, the extensive 57-strong collection is perfectly designed to suit a wide range of wedding styles, featuring everything from lush botanicals and woodland animals as well as contemporary geometrics. Last week we brought the the great competition from Mr Kipling to win a wedding makeover, for couples getting married the same weekend as the Royals. Now we can tell you about the new limited edition range of Royal Wedding cakes that they launched yesterday! We have had the pleasure of tasting them in the office and we think they're delicious! If you want to get your hands on them get down to Asda today, where they'll be on sale unitl the 16th May. The wedding of the year is fast approaching, providing the perfect excuse to celebrate. However you're planning on celebrating the big day. Mr Kipling has got you covered with it's limited edition range of cakes, especiallu made for the Royal Wedding on the 19th May. Iceland cordially invites its customers to indulge in a slice of the royal wedding as it launches a limited edition celebration wedding cake, for one week only. The handmade elderflower and lemon cake, available from 14th May 2018, will cost just £8.00 - so, at 66 pence per slice, it’s a fraction of the £50,000 proposed cost for the royal cake. But don’t delay, there are a limited amount of cakes per store*, and when they’re gone, they’re gone. A wedding cake is most probably the most expensive cake a bride and groom will ever purchase. Therefore, a lot of thought normally goes into the process of choosing and deciding the design, flavour and all the little details that a wedding cake entails. Faye Palmqvist. from Sweet Elements, a bespoke cake catering business based in Fulham and founded by Le Cordon Bleu–trained pastry chef, has shared her tips on what to consider when choosing your wedding cake. Since I started my wedding cake business I soon came to realise that weddings are no longer about following rules on colour and traditions and are increasingly finding new and exciting ways to push the boundaries and wow the guests. This is why I absolutely love having my part in the industry because I find that pushing boundaries is so important when finding inspiration to create exciting new designs. There’s no doubt that the wedding cake is one of the most important aspects of the day – the style, flavour, and how many tiers all considered. But have you ever thought about the ingredients that make up your cake? Celeste from The Organic Wedding Cake Company has created a whole business off the back of her love for organic produce and the demand for organic cakes. She’s been buying organic for over 15 years but has been baking cakes for a lot longer and so it was only natural to bring the two together as a business. Wedding photos are one of the most important aspects of every wedding. Why? Because they capture the magic of the day and enable you to fondly reminisce in many years to come. Propel your wedding photos from run-of-the-mill images to fairy-tale moments of the big day with the following stand-out features designed to inject the wow factor into every type of wedding. With their pretty rainbow tones, floating motion and fairy-like appeal, bubbles have long been a favourite prop for photographers. The charming allure of bubbles make a great addition to a wedding and bring a magical feature to the special day. Bespoke Wedding and Celebration cakes homemade with love. If you can dream it, we can create it. How good is your victoria sponge or chocolate cake? 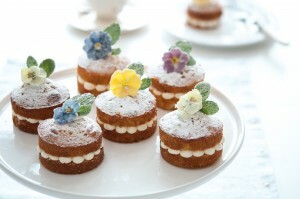 ENTER THE GREAT BRITISH FOOD FESTIVAL 'CAKE OFF' AND FIND OUT! Set in the grounds of the magnificent Elizabethan country house, the hall near Chesterfield in Derbyshire provides a stunning venue for The Great British Food & Drink Festival. The event is back this for three days between the 30th April and the 2nd May, opens its gates at 10am each day. Read more about How good is your victoria sponge or chocolate cake? The wedding cake is possibly one of the most established elements of a wedding day. From choosing the cake maker, design and flavour choice, to the ritual of cutting the cake together, it is undoubtedly an essential part of culinary planning. Traditionally, the wedding cake takes the form of a tiered masterpiece covered in thick white fondant icing and perhaps a few fondant roses. This year however, the vintage inspired wedding cake is set to be huge! Sammi-Jo Gascoyne, established chef and owner of Blushing Cook, gives us her thoughts on what we can expect to see in 2016.